Some people consider as miraculous phenomena that involve the suspension of natural order – phenomena such as walking on water or lifting a hill. Such miracles are derided as irrational and impossible by skeptics, who deem the natural order inviolable. Yes, any suspension of the natural order is extraordinary – it requires an explanation. But, then, even the natural order requires an explanation. Nature’s orderliness is ordinary in terms of familiarity, but not in terms of explainability. A fruit falling is ordinary in that it happens regularly, but what makes it fall in a fundamental sense remains elusive. Can’t we attribute the fruit’s falling to gravity? Not exactly, because gravity is our nomenclature for that orderly behavior, not an explanation of that behavior’s origin. Can’t we attribute gravity to the curvature of space-time? Possibly, but then the source of space-time needs to be explained. Invoking one concept to explain another concept doesn’t yield an ultimate explanation – it only defers that explanation. Taking the questioning spirit to the most fundamental level: if everything has emerged from unguided natural processes acting on insentient material particles – as most skeptics presume – why should the emergent phenomena feature any order, leave alone an order of mathematical precision? Ultimately, the existence of the natural order is most rationally explained by positing a trans-natural first cause, a transcendental intelligence. 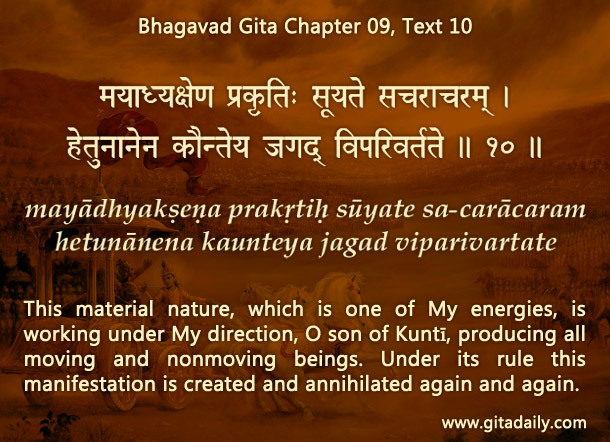 The Bhagavad-gita (09.10) indicates that overseeing intelligence to be Krishna. By his inconceivable potency, he arranges for the orderly functioning of nature; and occasionally, for serving some special purpose, he temporarily suspends that order. When we thus seek the fundamental cause of things, we see that both the operation of the natural order and its suspension are miraculous – both point to an explanation beyond nature, and both enhance our appreciation of the transcendental divine.